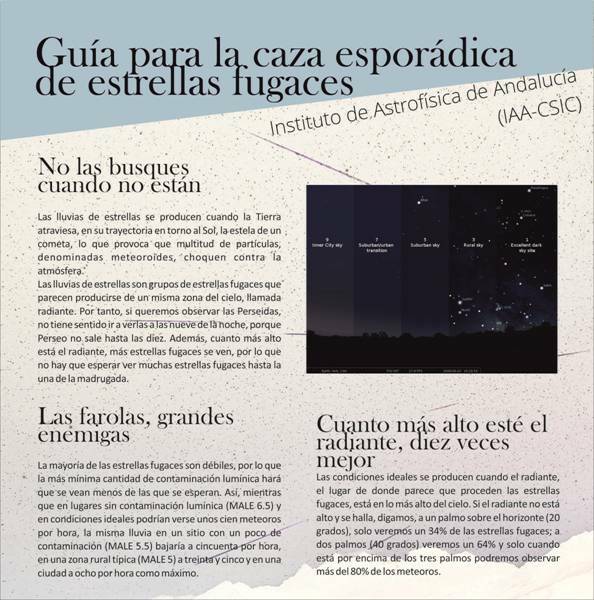 The Instituto de Astrofísica de Andalucía (IAA-CSIC) and Calar Alto Observatory participate in two proposals of public outreach related to the meteor shower. Granada / Almería, July 31st 2017. Every year, between the end of July and the end of August, the Earth, in its trajectory around the Sun, passes through the tail of Swift-Tuttle comet, causing that multitude of particles, denominated Meteoroids, hit the atmosphere. 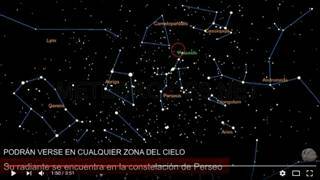 As the Earth enters into this cloud of meteoroids, the activity of the Perseids increases. This year the peak visible of this phenomenon in Europe will be reached during the night of 12nd to 13rd August. "Comet Swift-Tuttle completes an orbit around the Sun in about one hundred and thirty-three years, and every time it approaches to our star it heats up and emits jets of gas and small solid particles that form the tail of the comet," points out Alejandro Sánchez, researcher at the Instituto de Astrofísica de Andalucía (IAA-CSIC). Most of the meteoroids detached from the Swift-Tuttle comet are as small as a grain of sand, and when they reaches our planet they impact with the atmosphere at a speed over 210,000 kilometers per hour, equivalent to cross our country from north to south in less than twenty seconds. This collision causes that these fragments increase their temperature up to five thousand Celsius degrees in a fraction of a second, which causes them to disintegrate and emit a flash of light that receives the name of meteor or shooting star. The disintegration of these fragments happens at high altitude, usually between one hundred and eighty kilometers above ground level. Larger particles (with the size of a pea or larger) can produce much brighter shooting stars that are called bolides. This year the Moon will interfere with the observation of this phenomenon, so the visibility conditions will be adversely affected. It is recommended to observe the meteor shower on the night of 12nd to 13rd August, when the peak of activity is expected (it is estimated that there will be a maximum of about a hundred meteors per hour). 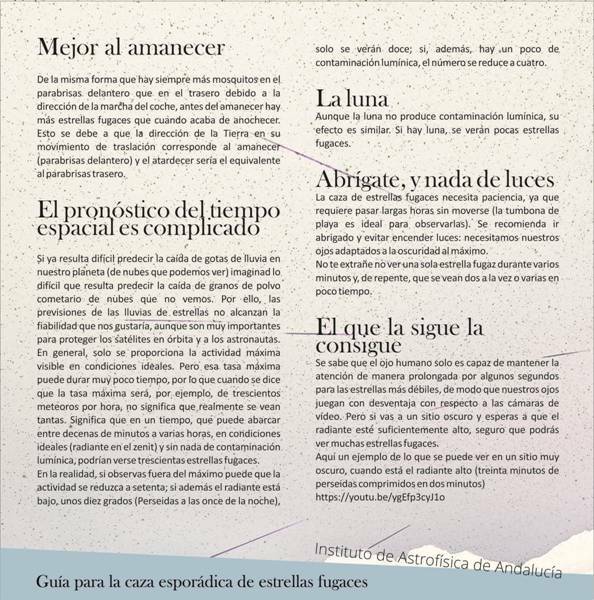 The Instituto de Astrofísica de Andalucía (IAA-CSIC) participates in a public outreach activity in Sierra Nevada (Granada), and Calar Alto Observatory (Almería) hosts an explanatory session about this phenomenon, organized by Azimuth. The most luminous phenomena recorded with the cameras of the SMART project, whose Principal Investigator is Professor José María Madiedo (University of Huelva), and with Calar Alto Observatory surveillance webcam will be displayed on the Meteors and Fireball webpage. The German-Spanish Calar Alto Observatory is located at Sierra de los Filabres, north of Almería (Andalucía, Spain). It is jointly operated by the Instituto Max Planck de Astronomía in Heidelberg, Germany, and the Instituto de Astrofísica de Andalucía (CSIC) in Granada, Spain. Calar Alto has three telescopes with apertures of 1.23m, 2.2m and 3.5m. A 1.5m aperture telescope, also located at the mountain, is operated under control of the Observatorio de Madrid.